The sesamoid bones are a pair of small bones located on the plantar aspect (bottom) of the great toe joint. 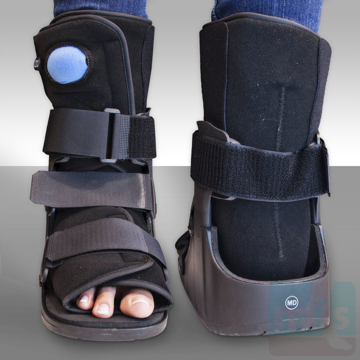 Sesamoid fractures can be the result of a direct force applied to the sesamoid, such as in a fall from a height. 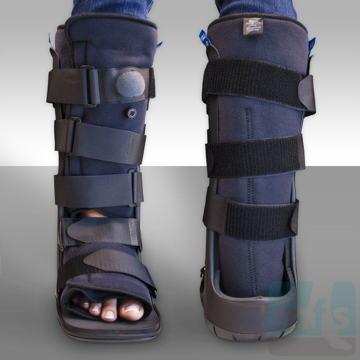 Sesamoid fractures can also occur as a result of a traction force. A traction force is created by the flexor hallucis brevis muscle (FHB) pulling against the sesamoid while the hallux (great toe) is held in a fixed position. Sesamoid fractures occur unilaterally, rarely bilaterally. 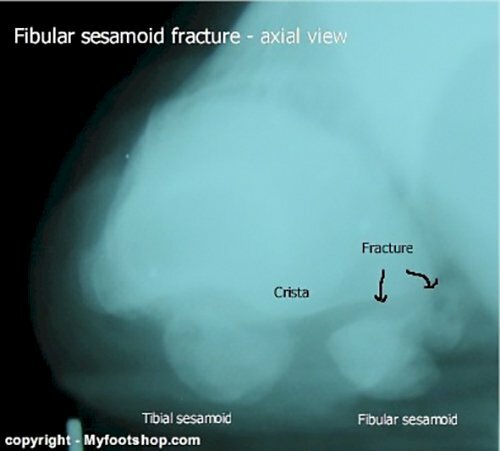 The tibial (medial) medial sesamoid is fractured more commonly than the lateral (fibular) sesamoid. Sesamoid fractures are found equally between men and women. The sesamoids bones function to transfer the force of the flexor hallucis brevis (FHB) tendon as it rounds the undersurface of the great toe joint. The function of the sesamoid bones is similar to that of the knee cap (patella.) Both the sesamoids and the patella facilitate the transfer of force generated by a muscle around a joint to create action distal to the joint. Diagnosis of a sesamoid fracture is often made with an x-ray. Subtle sesamoid fractures can also be diagnosed with MRI or a bone scan. The image at left shows a bone scan, suggesting a fracture of the right tibial sesamoid. Although bone scans cannot specifically diagnose a sesamoid fracture, they can reveal areas of inflammation consistent with a fracture. 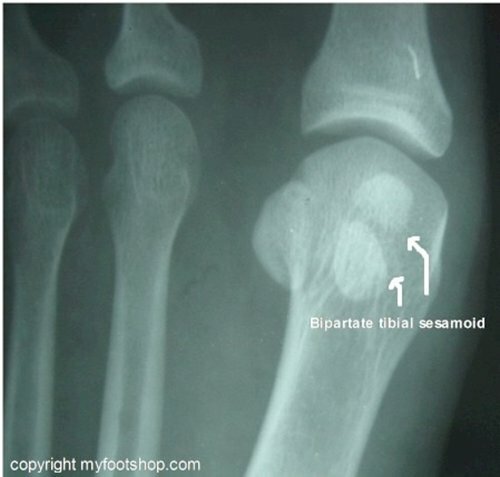 Sesamoid fractures need to be differentiated from bipartite, or two-part sesamoids. Bipartite sesamoids are found in less than 10% of the general population. Bipartite sesamoids are usually found bilaterally. Therefore, one way to differentiate a bipartite sesamoid from a fractured sesamoid is to take a comparison x-ray of the non-symptomatic foot. Bipartite sesamoids usually have a rounded appearance at the separation of the two fragments, while fractures are typically sharp-edged, without rounded edges. Although expensive, MRI represents the best diagnostic test in that MRI is able to differentiate between sesamoiditis, a fracture, and a bipartite sesamoid. The two sesamoid bones are located on the bottom surface of the first metatarsal phalangeal joint (1st MPJ.) The sesamoids are actually a working part of the 1st MPJ and articulate with the plantar surface of the first metatarsal. The sesamoid bones are an extension of the flexor hallucis brevis (FHB) muscle and give the FHB a greater range of motion and improved lever action at the level of the 1st MPJ. The flexor hallucis brevis muscle (FHB) originates on the plantar surface of the calcaneus (heel bone.) The function of the FHB is to plantarflex the great toe. The primary function of the FHB is to aid in balance and assist the calf with the toe off phase of gait. As the FHB fires, the load generated by the body of the muscle is transferred through the sesamoid to an extension of the FHB that attaches to the plantar aspect of the base of the great toe. 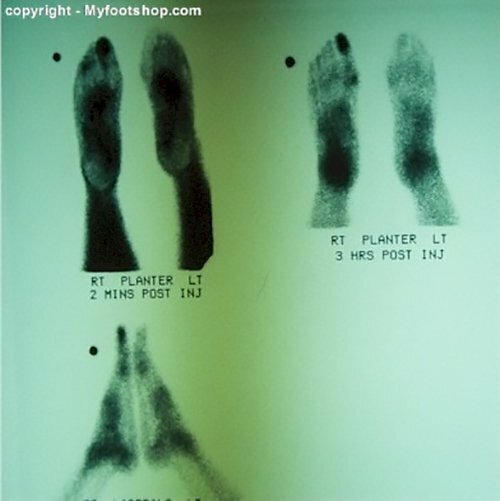 The net result is that the great toe plantarflexes using the sesamoid bones to glide around the plantar surface of the 1st MPJ. Sesamoid bones are referred to by their location and are called the tibial sesamoid (medial) and the fibular sesamoid (lateral.) Tibial and fibular make reference to the bones of the lower leg: the tibia and fibula. Sesamoid bones are most common to the 1st MPJ but may also be found at other tendon/joint surfaces where a tendon changes direction. Contributing factors to sesamoid fractures include the use inappropriate shoes for work and sports. The treatment of a sesamoid fracture begins with a period of conservative care. Treatment during this conservative period includes decreased weight bearing and limitations on activities. Most patients who have a sesamoid fracture can remain ambulatory with just a few simple changes to weight bearing. The first way in which weight bearing can be changed is called off-loading of the sesamoid. 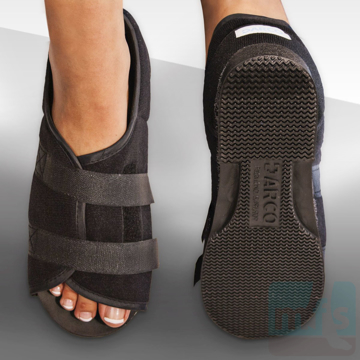 The sesamoid can be off-loaded with the use of a dancer's pad or forefoot reliever off-loading shoe. 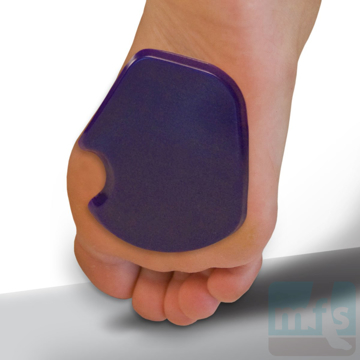 A cam walker with a rocker sole can also be helpful in reducing load to the sesamoid while healing. This period of off-loading may last 6-8 weeks. The most common outcome of a sesamoid fracture is that the fracture heals with an asymptomatic fibrous union. This fibrous union is not true bone but rather a tissue made of collagen that is strong enough to support the normal function of the sesamoid. 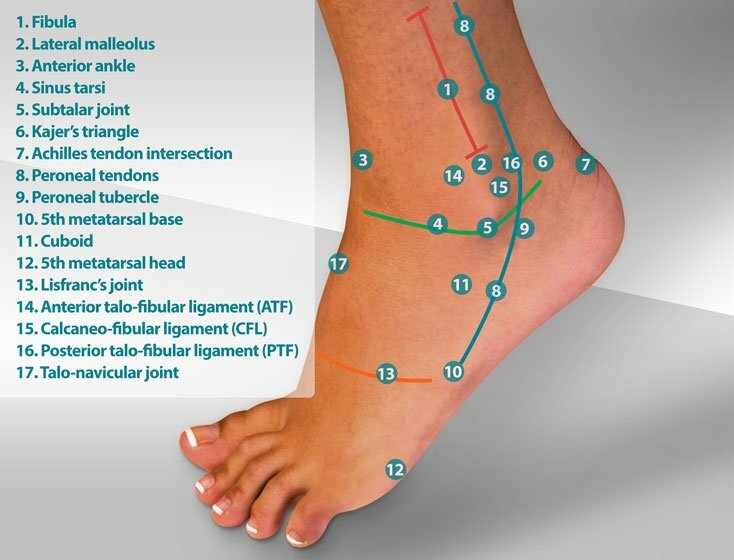 Often we'll see that this fibrous union is adequate for some activities but becomes painful with sports or increased duration of time on the feet. 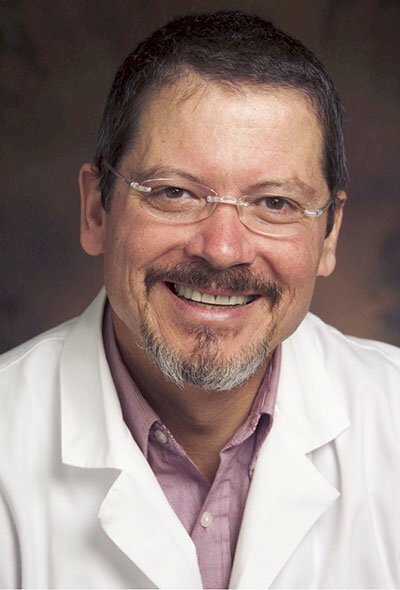 If this is the case, patients will experience transient pain with increased activity. High-heeled shoes also will aggravate a fibrous union of a sesamoid fracture. Some sesamoid fractures will not heal and present with continued pain. 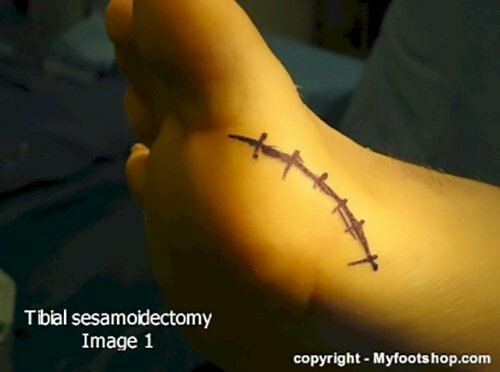 If this is the case, a surgical excision of the sesamoid called a sesamoidectomy is performed. The tibial (medial sesamoid) is excised through a 3-4 cm incision on the medial aspect of the great toe joint. 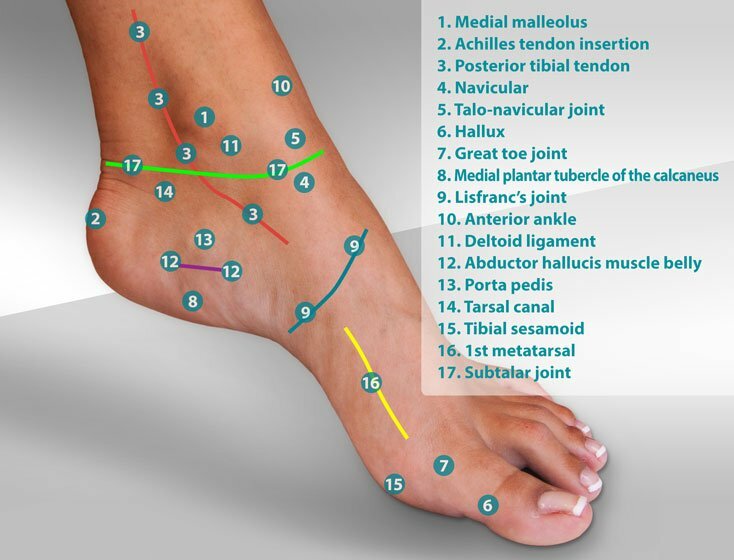 The fibular sesamoid is excised either through a dorsal (top of the foot) incision or a plantar (bottom) incision. The plantar incision affords a better approach to the fibular sesamoid but necessitates 3 weeks non-weight bearing following surgery to avoid direct pressure to the plantar incision. Many surgeons prefer to excise the fibular sesamoid through a dorsal approach to enable immediate weight bearing on the foot post-op. Partial sesamoidectomy for sesamoid fractures is rarely advocated by surgeons due to the consistently poor outcomes of this procedure. 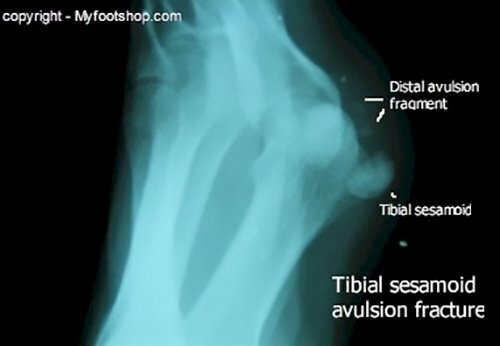 Fixation of sesamoid fractures is also an uncommon technique used in treating sesamoid fractures. Most surgeons will avoid using pin, screw or absorbable fixation due to the high success rate of traditional, complete sesamoidectomy. A sesamoidectomy (both tibial and fibular) can be performed at a hospital or surgery center on an out-patient basis. Local anesthesia with sedation is the preferred anesthetic. Partial-to-full weight bearing is possible post-op depending on the incision site. No weight bearing for three weeks is the rule for plantar incisions used to access the fibular sesamoid. Most sesamoidectomies heal uneventfully in 6-8 weeks. The success of this procedure is good to excellent. The images below show the steps used to perform a tibial sesamoidectomy. Image 1 shows the incision planning. 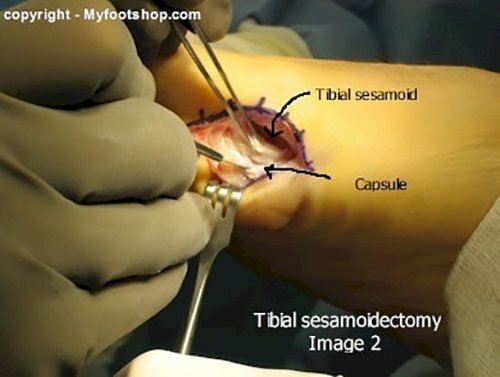 Image 2 shows exposure of the tibial sesamoid and dissection of the sesamoid from its attachments to the capsule of the 1st metatarsal phalangeal joint. 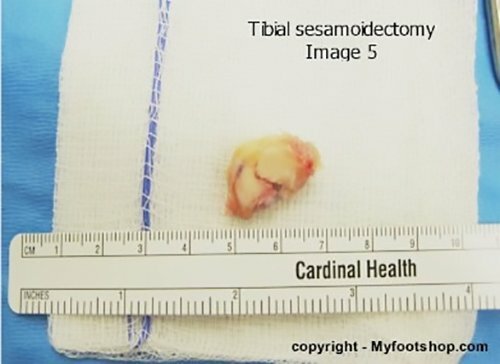 Image 3 shows that joint following excision of the sesamoid. 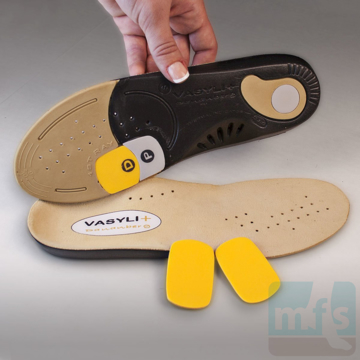 The surgical void is inspected to ensure no damage occurred to the flexor hallucis longus. Image 4 shows final closure and image 5 shows an intact but fractured tibial sesamoid. 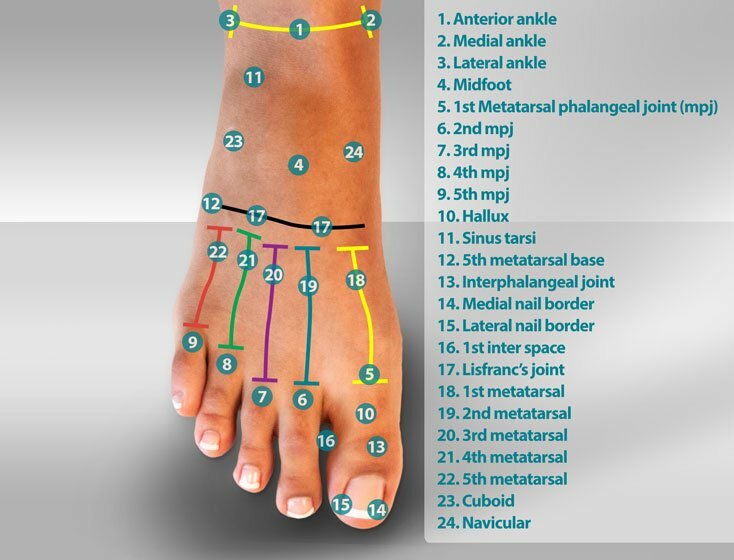 Sesamoid pain that does not respond to conservative care should be evaluated by your podiatrist or orthopedist. Sesamoid Fracture by Myfootshop.com is licensed under a Creative Commons Attribution-NonCommercial 3.0 Unported License.